As his Alzheimer’s developed he became more and more expressive. He became less and less inhibited. Mary, the housekeeper, went into Ed’s room at the Alois Center one day and emptied his waste paper basket. “Oh,” he said. “Thank you! Thank you so much!” Then he kissed her hand. “You are so beautiful, he said” “Why thank you, Ed,” Mary said. Before he had Alzheimer’s, Ed rarely complimented people. But as his Alzheimer’s developed he became more and more expressive. He became less and less inhibited. Compliments tumbled from his mouth on every occasion in which they could possibly be warranted. Lack of inhibition, such as seen in this story, is a trait of many people living with Alzheimer’s. It can lead to unwanted behaviors, as I discussed in my previous article on the topic, What to Do About Loss of Inhibition and Problem Behaviors Caused by Dementia. 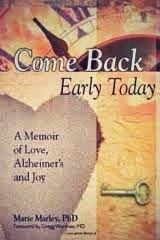 However, as with many things to do with Alzheimer’s, there is the other side of the coin. In my personal experience, lack of inhibition can be just as positive and beautiful as it can be negative. Here are some wonderful examples of lack of inhibition from Ed. They fall into three general categories: 1) Giving sincere lavish compliments, 2) Freely expressing physical affection, and 3) Openly expressing love. Ed complimented people profusely and sincerely. He was forever telling the staff at the Alois Center how beautiful they were and how lucky he was to have their help. After a long silence he asked, “Can I tell you how beautiful your earrings are?” We both burst into laughter. Once he told Maria, the receptionist, that she was the most beautiful woman in the world and he really meant it from his heart – it wasn’t just words from his lips. Although before developing dementia Ed was rather reserved when it came to expressing physical affection, when he had dementia, he changed. For example he usually held the hands of his visitors – even the men - often all the way through their visit. He also displayed physical affection to other residents – also including the men. One day a few weeks after Ed moved to the Center, I arrived to find him sitting on the sofa beside a resident named John. I was surprised to notice they were holding hands. When I entered the room they smiled broadly and took turns telling me they were best friends and they moreover, they had been best friends for years. It was very touching. Ed was also consistently affectionate toward the staff. One of his hallmark traits was kissing the hand of anyone who entered his room, regardless of the reason they were there. The most beautiful example of this was the following interaction he had with an aide named Angel. He said he didn’t but patted the empty space next to him on the sofa, inviting her to sit down. She did and the three of us engaged in pleasant conversation. After a while, Ed reached up and began to gently stroke her golden hair. She smiled and put her arm around his shoulder. It was a lovely and natural gesture that warmed my heart. I took my little Shih Tzu to visit Ed one day. When I entered his room I found him dozing in his wheelchair. He lifted his head when I greeted him. I put Peter on Ed’s lap. Ed started stroking him slowly, his hand starting on Peter’s head and moving down his back all the way to his tail. Then back to his head again and slowly down his back. When it was time to leave, I started putting on my jacket. “I love you,” Ed said. I was startled. In 30 years we’d never said those words to each other. We knew it and never felt the need to say it. “I love you, too,” I said simply, looking in his eyes. Yes, it took thirty years and one of us getting dementia to break down our mutual inhibition about openly expressing our love for one another. If only we all could such beauty everywhere we looked. If only we all could express love and affection so openly and effortlessly. Does anyone else have any positive stories about their loved one’s lack of inhibition?